Pineapples are Costa Rica’s largest agricultural export, and its largest and most lucrative agro-industry. 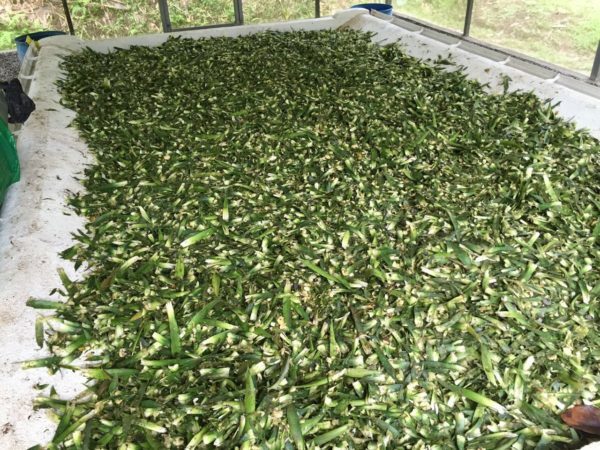 But one of the industry’s major issues is that it produces a large quantity of organic waste, mostly from discarded pineapple leaves. What to do with the waste itself is not the only problem–it also attracts mosquitoes and contributes to contamination and disease. Professor Irene Alvarado of EARTH University, a member of The Lab’s Advisory Board and a Global Sustainability Fellows Faculty Member, has begun working with one of the largest pineapple farms in the area to resolve the problem with the help of the soldier fly. Soldier fly larvae are marvelous agents of decomposition. What’s more, their pupa are extremely high in protein. Alvarado’s project breeds the soldier flies, which hatch from eggs and become larvae, feeding on the pineapple plantation’s organic waste. When the larvae become pupa, they are harvested to be used as animal feed. 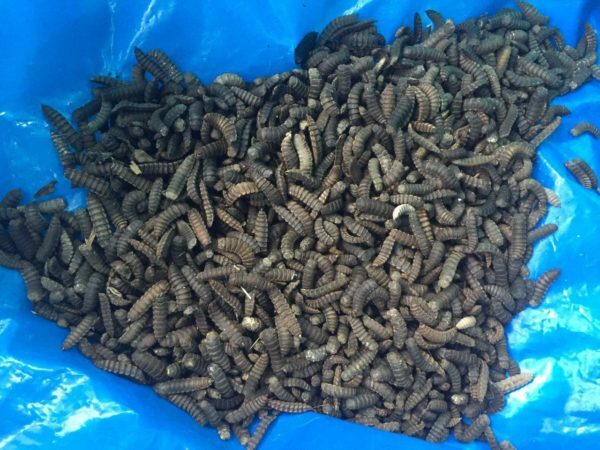 Though these pupa can be used to feed chickens and other farm animals, the project is currently focusing on using the pupa as fish feed, experimenting with how to best harvest and concentrate the pupa to create the most nutritious fish diet. 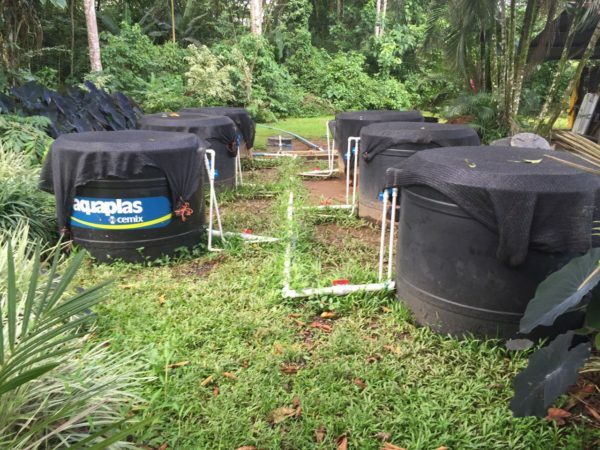 The fish themselves are grown in closed containers and water from the containers, rich with nitrogen from fish manure, is being recycled as fertilizer for vegetable gardens (applied to the roots and not the vegetables, to avoid contamination). This closed loop system presents a completely sustainable model for providing a balanced diet for both animals and humans in food insecure areas, while reducing the organic waste from one of the region’s biggest waste-producers. Alvarado and her team are currently measuring the results of the experiments to see how they can best scale the project. Currently, they are effectively managing three tons of pineapple leaves per week, and feeding six tanks of fish, but their goal is to process five tons of organic waste daily–the magic number for reducing pineapple plantation waste to zero. This process also has implications for CO2 emissions, as reducing one ton of nonsegregated organic material results in a reduction of one ton of CO2. “I have hope that we can sustainably resolve this huge problem, which has greatly affected this part of the world,” said Alvarado. Alvarado also sees great potential in connecting the benefits of this project to the plight of nearby Martina Bustos, a challenged community of Nicaraguan migrants. The Lab and its Global Sustainability Fellows began working with the community in the summer of 2014, a partnership which resulted in “Project Transition,” a plan for a comprehensive, long-term sustainability initiative to be implemented by The Lab in collaboration with EARTH University and the community. One of Martina Bustos’s major challenges is food insecurity, and many in the community report routinely suffering from hunger. They also live amidst a large, open dump, which they scavenge in order to get by. The Lab is excited about the potential of bringing this important project to the community of Martina Bustos and other food insecure communities in arid regions, and is proud to support Professor Alvarado’s soldier fly project with a small grant.